Learning how to prepare delicious meals with the vegetables that are in season is both challenging and rewarding. Challenging because our choice of repertoire is limited to what we can pick ourselves or purchase locally, but rewarding because it is amazing what lovely meals can be made with a bit of imagination. For those who grow their own vegetables, it is very satisfying to eat a meal using ingredients foraged from the garden. We have reached a stage in the winter when I feel I have had enough heavy winter food and need an input of some more invigorating lighter food. This week we have made some big salads with farm produce and other locally sourced ingredients. 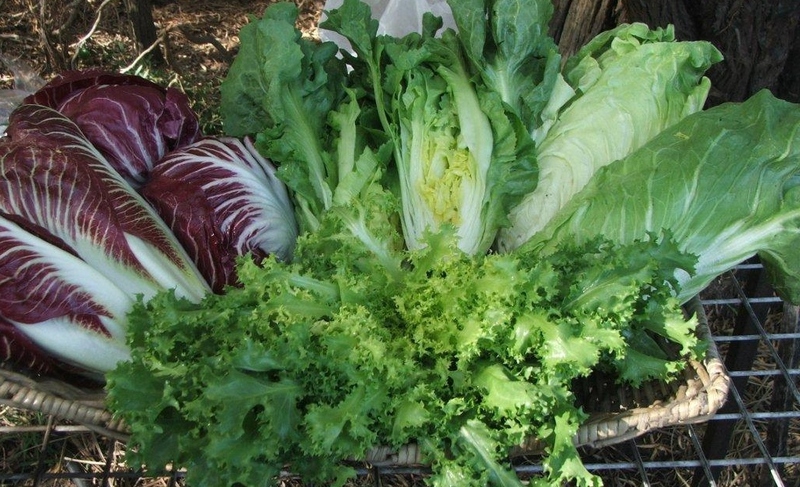 The chicory family: (clockwise from LHS) Treviso chicory, scarole, sugarloaf chicory, frisee. This salad is a perfect way to eat the chicory family greens – radicchio, frisee, scarole and sugarloaf endive. They are amazing performers in a winter garden and well worth growing. 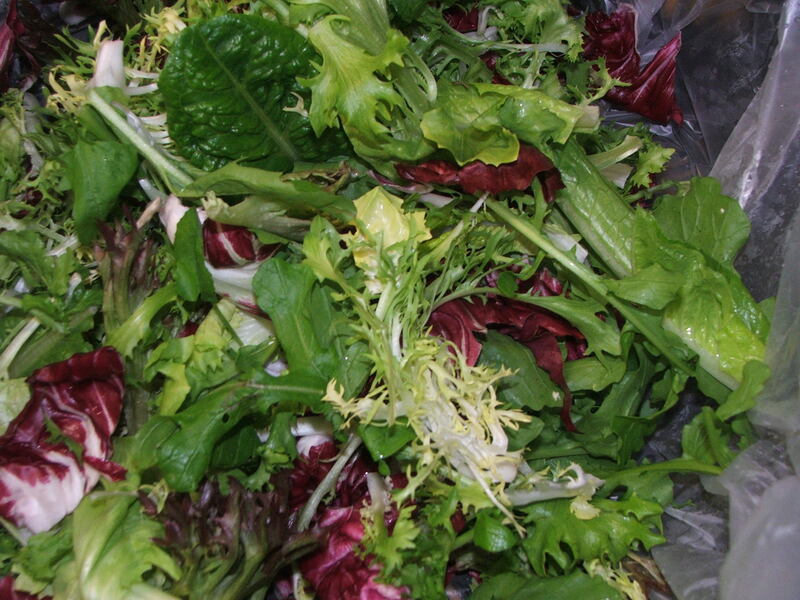 Any of these leaves and lettuce leaves are used as a bed, on which sliced slightly underripe pear, a small amount of thinly sliced red onion and walnuts are scattered. A vinaigrette of olive oil and balsamic vinegar, salt and pepper is drizzled over before serving. Bitter Green salad with fennel and Oranges. Fennel is another vegetable which thrives in the cool wet Albany winter. Navel oranges are also in season now. Fennel and orange salad is a favourite salad combination, to make a bigger salad make a bed of bitter green and lettuce leaves as above. Scatter over a thinly sliced bulb of fennel, orange slices, red onion slices and kalamata olives. Dress as above. We made this to serve as a side salad with the well known Vietnamese beef stew Bho kho. Mix together finely shredded cabbage and other finely shredded vegetables such as carrot and beet leaves, coriander leaves and a shredded apple. Make a dressing from lime juice, fish sauce, sugar, rice wine vinegar, crushed garlic clove and some finely shredded chilli (if you like a bit of heat) and mix this through the shredded ingredients. This entry was posted in Food, Produce in season, Recipes and tagged chicory, endives, fennel, food, recipe, vegetables on August 14, 2013 by jocelyn2013.